The Golden Lion was located on the eastern side of Denmark Hill, next door to where the HSBC is now, on the corner of Orpheus Street. Thanks to Barry for pointing out my original location error. November 2016 update. 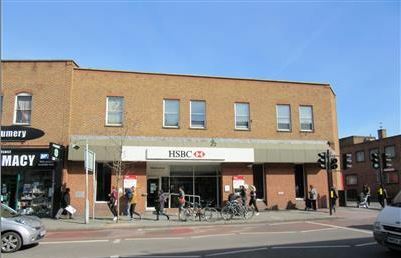 It appears the HSBC is now closed. The first mention of the Golden Lion I have come across is Middleton Bailey’s 1808 Perambulation of the Parish of Lambeth. Held at the Lambeth History Archive, Minet Library. 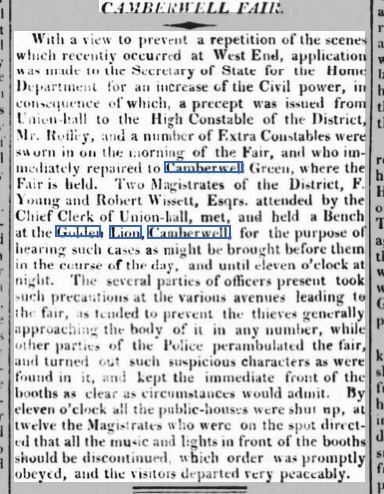 In 1819, the Golden Lion was used as a temporary court to try urgent cases arising from misbehaviour at Camberwell Fair according to the following report from the Morning Advertiser, 20 August 1819. In 1838, the Golden Lion was used as a meeting house for the Camberwell Vestry, the then equivalent of the local council. The 1st landlord recorded to date was Robert Sturt in 1848, who was listed in the Post Office Directories in 1848, 1851 and again in 1856 as a wine & spirit merchant.. In 1861, William Neats is the landlord living with his wife Sarah, son William JSC, aged 21 and daughter Emily aged 12, Also listed in the 1861 census were Hannah Browning, 27, barmaid, Charlotte Davis, 25 the cook and Lucy Wrightson, 18 the housemaid. In the 1881 census, William Temple is listed as landlord. He was 49 years, a widower born in St Pancras. He lived with his daughters Sarah, 27 & Alice, 18 and a son Edward, aged 20. The Staff are listed as Eliza Jones, 66 the house-keeper, widow, Bessie A Spaun, 18, barmaid and Emma L Poles, 21 a general servant. On 20 Feb 1891 William Temple was declared bankrupt. 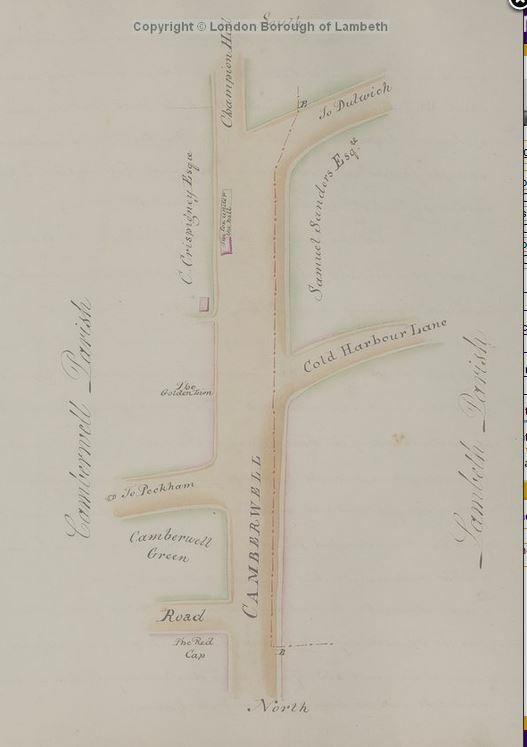 In this extract from the Ordnance Survey map from 1892-96 the Golden Lion is located next to the Palace of Varieties. And this architects drawing circa 1896 shows the Golden Lion and the Oriental Palace of Varieties. In 1896, Charles Mott is recorded in the Post Office Directory as Landlord followed by George Edward Sidebottom in 1901, again in 1905 and 1908. The postcard is undated but probably around early 1900’s. In the postcard below,the pub just shown behind the Theatre. Undated but similar to above, probably early 1900’s. Francis Joseph Pepper was the landlord in 1911 through 1919. The above postcard published by W Greening. In 1938 Frederick C Twining & Wm Chas Wentworth and again in 1944 are shown as joint Landlords. The pub sign was photographed by a photo agency in the 1950’s. Two more photos from the Southwark Local history collection held in the library in Borough High Street. Undated but probably early 1970’s just before demolition. If you look carefully you will notice the statue of a lion of the roof of the Golden Lion in some of the photos. The next two photos show the whole east side of Denmark fenced off prior to demolition and with demolition underway. The whole section was demolished to make way for the Butterfly Walk development. Here is a photo dated 1976 showing Denmark Hill looking south with the Golden Lion still “alive”. This entry was posted in Denmark Hill, Pubs and tagged Denmark Hill, Golden Lion, Pub. Bookmark the permalink. Catalogues for sale of Charles Gastineau’s effects c1818 were made available at The Golden Lion. Hi Barry, thank for pointing out my Golden Lion location error. You are correct, the map in the post shows it. I have corrected the Golden Lion post. Where was your house located ? My uncle had the golden lion in the late fifties his name was Frank Jewell ,I have attached a photo of him and his a.c. saloon in the yard of the golden lion,which is visible in the ordinance survey map of 1892-1896 near the top of your page .The entrance of which can be seen to the left hand side of the pub in many of your photographs.Hope this is of interest to you.